There are those who come into your life, are there for a few moments ( days, months, maybe even years), and then they are gone, moved on to intersect with someone else's path......but they leave a residue......of love, friendship, of connection. You may or might not see them again......life is funny and cruel that way. I have thought of some of those in my life today........I hope that their candle burns as bright as it did when our paths crossed......and that maybe the residue from me, still lingers with them. Goodbyes are not often thought of as goodbyes........usually, there is hope, there are plans to meet again.....but in the scheme of things, there are few hello agains. Tonight, I wish the residue that we all leave behind us continues to connect us and that one day, somewhere......there it is......hello again. Tonight, may we all have a good life. Today was Jordan, our great nephew's birthday, he was six.......it was also a snow day (no school). I had promised that we would bake cupcakes for him to share with his classmates. We made two dozen cupcakes, 18 for his classmates and a few extras to share with a hungry teacher or office worker tomorrow. I can't believe he is six, he told his mom this morning that he grew last night, because today was his birthday. 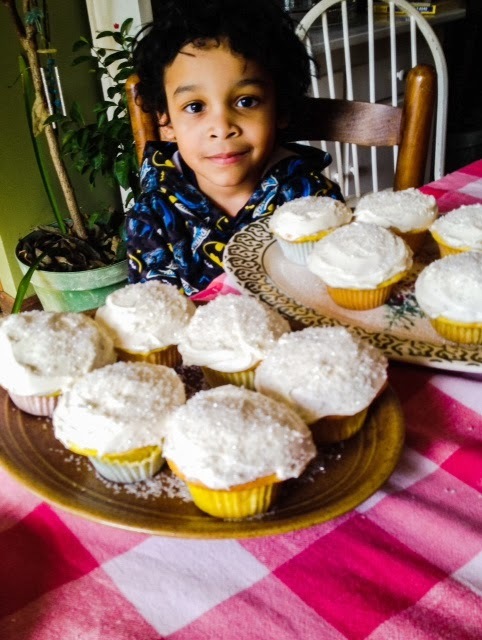 We decorated the cupcakes with white sugar sparkles to resemble snow.......this is a birthday he won't ever forget. Our world is starting to get back some sense of normal......there are still thousands of cars on our roads and interstates, still icy conditions, but people are starting to make their way home. The past forty-eight hours has been unforgettable and scary. Tomorrow the temps should be above freezing. his girlfriend's baby this morning in their apartment.......911 folks talked him through the delivery, mom, baby girl and dad are doing fine. Snow and ice, took some lives, but it also brought at least one new one today. I hope that you all are warm and safe, though the wind and the snow may be knocking on your door......and for those of you down under, I hope you get relief from the heat soon. our little neck of the woods is a mess tonight.....all across our area and south, roads are closed, snow is falling and people are stranded on the roads. I have family and friends who were in Birmingham today, left there at lunch and a normal one hour drive has taken around seven hours. People are stuck in their offices, kids are spending the night at their schools, the National Guard has been called out.......I know you are thinking, those damn southerners, they can't drive in the snow. This was a unique and different storm, usually when we get snow, it is wet and slushy and the ice hits that night. This came in around eight this morning, dry and powdery and within a half hour, the roads were frozen.....our temps have sat at 19 degrees all day. 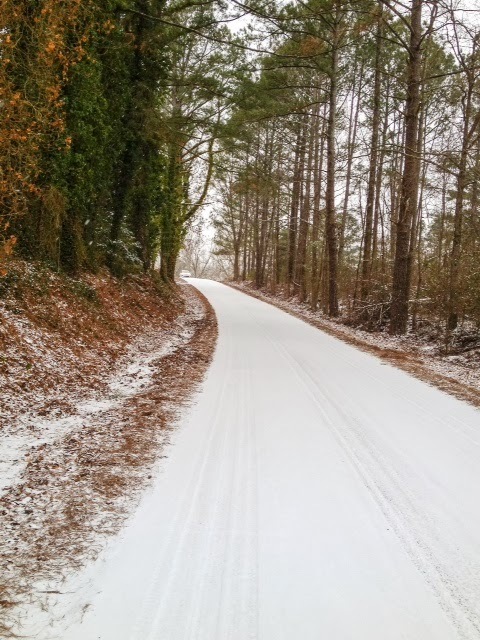 The picture is the road that leads to our house around nine this morning. I see on the news the snow is moving east, for our friends north and east of us, heads up.....this one is a mother. Stay warm and cozy and safe. Yoga classes today and tonight were all about intention......often, when we do yoga postures it can be much like our daily lives......we go through the motions with not much thought about what we are doing. In these classes today, as we did each asana I discussed not only what that particular pose did for the body, but how we could apply it to our daily lives. another example: cow/cat pose.......we practice that posture for flexibility to our spines.....but we can also use it to remind ourselves to keep flexibility in our lives, to not be afraid of change, to embrace the changes that we face. It is bitter cold here in the south tonight, and I know for many of you in other regions of the USA, it is frightfully cold. Stay warm, stay safe, this too shall pass. Twenty three years ago, in the wee morning hours our phone rang......that called changed my life forever. I could hear Rick's voice, I knew something was wrong, really bad.......when he hung up the phone, he told me to get dressed. I asked him if my dad had died.......I had just seen him the evening before, but I knew in my heart he was gone. A week before, he had been at our house chopping wood for their wood stove.......but he had lung issues and heart issues.......and I knew he was gone. It seemed our family in a two week period had dealt with nothing but grief......my sister-in-law's dad had died and he and my father were good friends, neighbors had died, other family members had died, a young cousin had overdosed and my dad's best friend had died......eight funerals in two weeks......my dad's was the last. I think about my dad today, he died when he was seventy-two. He had a wicked sense of humor and a heart full of compassion.......he lived by the Golden Rule. At his funeral, so many friends and family members talked about him and his kindness......how whenever there was a need, he was there to do whatever he could. He taught me to love and appreciate Sundays, that was the only day he didn't work.......to read newspaper comics, to love ice cream, to love family, to be a good friend, to appreciate oysters on the half shell, to shoot pool, to drive, he insisted I know how to change a flat tire, and the oil in my car and to always carry a coat in the winter whether I thought I needed it or not. Before Christmas this past year, three of my friends dads died......all I could say was I am sorry. It made no difference to them that I knew how they felt, that I had stood in their shoes and had mourned the loss of my dad all these years.......how could I tell them, that even after all these years, the emptiness was still there, that his memory was such a poor substitute for him. That is a path you walk alone. and his best words of wisdom ever, "you have to work out your own salvation." Where ever you are tonight, I love you Poppa. My friend Kaye says that I am having to do treatments because all of my life I have taken care of others, she thinks the universe is telling it's time to let someone take care of me. Maybe she is right, I just know that letting someone do for me is difficult.......but it is so very easy for me to take care of others. I have the sinus gunk, and today it seems to be raging.......though I did take a couple of hours away from the sofa to celebrate Jordan's birthday. His party was so cool, it was held at the McWayne Science Center in Birmingham, Jordan is turning into quite the science geek so it was the perfect place to celebrate birthday #6. Though he did inform the young woman who did the animal show, that it wasn't really his birthday, not until the 29. Today brought back great memories from my childhood, of being in Chicago and going to those wonderful museums there. We took Sam when she was nine, and as soon as Jordan gets a little older, there will be a road trip for him to Chicago too......to visit the museums and meet some cousins......and even though his mom is now all grown up, I'll bet she might want to go back to the American Girl Place......just to visit. I hope you all have the weekend you need......get some rest, stay warm and don't forget to laugh out loud. 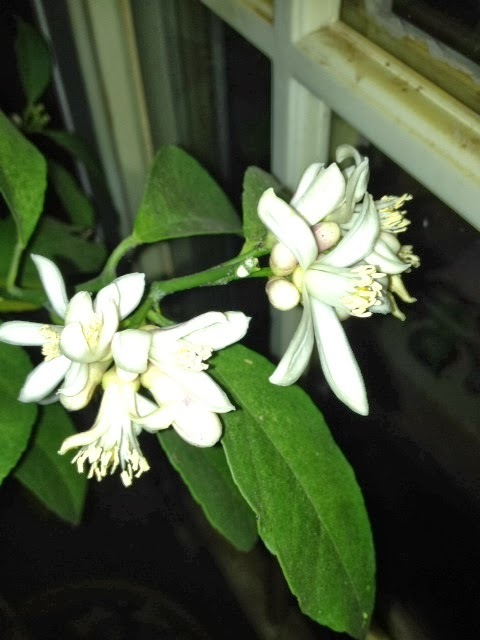 We have lemon trees, orange trees, grapefruit trees and avocado trees in our great room......none of them have ever bloomed. Last spring my friend Kaye told me about a lemon tree that would bear fruit here in North Alabama if I took really good care of it.........I bought one, a Meyer Lemon tree.......I did everything the nursery suggested. I came home from work a few evenings ago and as I stood at the back door gazing at the sunset, I noticed a sweet smell.......I was so excited I called Rick who was meeting with his publisher. Our little lemon tree is covered in blossoms, if every bloom represents a lemon.....we will have dozens.......I can make pitchers of lemonade. As soon as we have lemons you will definitely see pictures.......I feel like a proud momma. woman and could not catch anything.......wrong, I think Rick's sinus gunk has found me, and it is having its way with me tonight. It has been a good productive day, classes were good, to do list has shortened considerably. This is the coldest winter I can remember in many years, we are headed toward single digits again, and they are whispering the s word again (snow). At least I am getting to wear my sweaters, boots and coats. Today is my younger brother Ricky's birthday. We have always been close, Rick and I married in May, he and his wife, Deb married in July.......we live next door to each other. His kids have always had a key to our front door. Our mom had us after she had had six other kids, who were several years old than us. We were latch-key kids in the 60's and when I got my driver's license I took Ricky and his friends out, just like I did mine. I have always been his protector, truly his "big sister." He is an amazing man, he has had his share of health issues, five by-passes on his heart, lung surgery and he is a diabetic......he still works two jobs. His grandchildren adore him. He is Jordan's grandfather, since this past Monday was a holiday Jordan spent the day with us. I asked him if he knew what special day Wednesday was......yep, he knew it was Papa Ricky's birthday. He wanted to paint him a card, but he asked me to draw something on first. He wanted a cake, with candles and the number 60 on top, two smiley faces, and a heart on the inside. He asked if I would write Happy Birthday, and then he signed his named. It was beautiful and Papa Ricky' loved it. This afternoon Ricky's middle son Haven picked up a birthday cake and carried it down to the elementary school where Ricky is a custodian, we went down to share the cake. The teachers and staff all came to wish him a happy birthday and it seemed like half the kids. He is loved and respected . On the way home Rick and I talked about a quote that he placed on his vision board......it is one by Albert Einstein and I think it describes my brother Ricky. I think my brother Ricky is truly a man of value. For the past two days I have taught classes for back pain, yesterday one of my students told me he had back pain most days, today he told me his pain was much better. For many it is hard to think of yoga as a healing art, but it is. I don't teach it as a fitness, I teach classes for stress, pain, PTSD, anxiety, arthritis.....for many reasons, but not as fitness. Though yoga can be a great fitness science, bringing strength, flexibility and balance into your life, I love it because the process of breath, meditation and movement brings you inward. You discover things about your self, strengths and weaknesses.....you take a journey of relaxation and peace, you begin to appreciate what your body can do, and you learn how valuable silence can be, and what true energy is. Almost every one I know suffers from pain at some point in their lives, it's hard to accept that our bodies wear out, that all the abuse, wear and tear we put them through eventually catches up and we pay with pain. It's not that yoga takes the pain away, though many times it does.......but it helps us deal and manage the pain better, to live our lives with more dignity, and greater mobility. it takes some love and perseverance.....and laughter and a few tears. Sometimes, healing is not in the picture, but even then yoga can be helpful, breathwork and meditation can be calming and centering. The cold weather can be brutal for those with chronic pain, take care of yourselves tonight, stay warm, do your breath work, and remain as mobile as you can, eat fresh healthy foods, drink pure clean water and every day, try to find the beauty around you. New faces in all my classes today and tonight......I love to see people curious about yoga. It is wonderful to share the goodness of yoga, how good it makes you feel about your self, your body and how it builds confidence. I have thought a great deal about Dr. King today......his passion for fairness, his kindness and determination to see change take place with as little violence as possible. His willingness to sacrifice his life.......he saw hatred up close and personal. I can't imagine how it must feel to be hated for the color of your skin, yet I know that prejudice is still in our world......whether you be yellow, white, red, brown or black. If we could only unlearn our culture, if we were only willing to unlearn and see past our fears. Yoga teaches you to go inward, and I think when we go inward, we see ourselves with more truth, and honesty. I think we become kinder toward ourselves......and when we treat ourselves kinder, that kindness spreads to others. At the end of each class, I never see hate in anyone's eyes, I don't hear fear in anyone's voice.......I wish somehow we could keep that sense of peace and goodwill and spread it to our neighbors. Sending you all blessings tonight, blessings of peace, of kindness, of love......pass it on. Rick's birthday was last week.....the 15th, the day of my treatment....not a great way or place to spend your birthday. Friday morning we headed south to Orange Beach, about a five hour drive for us, but well worth it. It was almost as cold at the beach as it was here at home, but that glorious blue sky, and glowing sun and full moon made the cold much more bearable. We only spent a couple of nights, but we walked for hours, stuffed ourselves silly with oysters and shrimp and slept. We both needed the break, but poor Rick caught a cold. He says the trip was worth it. Some days a short get-a-way is the best medicine, at least it was for me.....and Rick says it inspired him to write two new columns. 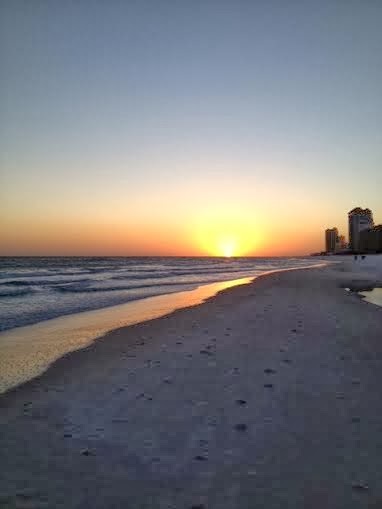 So here is Friday's sunset at the beach, wish you all could have been there. Can't wait to go back. I love the beach when it's cold and lonely. Rick has a cold, he never gets sick, but he is looking rather rough tonight. We went out for dinner this evening and you could hear people all across the restaurant coughing and sneezing. You would think with all this wind and cold weather, no virus could live, you would be wrong. We have consumed mass quantities of hot ginger tea, peppermint tea and lots of air borne. I had the crud when we vacationed in Jackson Hole in October, I don’t want it again. If wearing garlic cloves around my neck and not taking a bath would keep the stuff away, I would do it. The moon has been extraordinary this week, both its rising and setting. The night sky seems to know when the moon is at its best and even the stars twinkle a little brighter. For some reason I have missed my parents a great deal this week, they have been in my thoughts daily. Treatment week often makes me wistful, Rick does a great job of caring for me, but memories of my mom taking care of me are strong. It’s Saturday night, cold and and windy……I hope where ever you are tonight, you are well, warm and cozy. A week of gratitude and thanks……I have friends and family with serious health issues, three of them got really good news this week…..issues have not gone away, but diagnosis has changed for a couple, and treatments seem to be working for a couple. Trust me, anytime there is any good news with health issues……it is something to celebrate and be grateful for. I am day two after treatment, still weak and shaky, but better than yesterday and so far (knock on wood many times) no nausea…..some ache and chills, but nothing like the past couple of months. I think I can say…..slowing the drip worked. Happy Dance. A restful day, that will also be my agenda tomorrow…..and the next. Cold weather has returned with a vengeance, the wind is howling…..I hope all are cozy and warm tonight. I read this quote today and it struck a chord......I use to be the most impatient person in the world......waiting drove me crazy. I'm not sure when the change took place......I think it started when I became a care giver for my mom.....and then, after treatments started I realized that waiting no longer bothered me. The passing of years, a few birthdays under my belt, the loss of those I love, and illness........and one of the most valuable lessons so far......patience. It's like the old saying, "be careful what you pray for,you might just get it." If I had known all those times I wished for patience, what it would take to get it.......I might have wished for something else. I'm not so sure it's the shortness of time that teaches us patience or maybe it's just that as we age, we learn more about what is important and what is not........ we learn not to sweat the small stuff, to go with the flow, to chill......why did it take so long? Yoga has taught me a great deal about patience, to gently work myself into a pose, not to force or push, to honor my body, and to understand how those five minutes of stillness can change my life daily.....to appreciate my energy, and on those days when the fatigue hits.....to be patient with myself. being good on guitar or vocals or writing takes time.......cherish the moments, they don't last. My mom and dad were right......I learned patience. Treatment #25......today starts my third year of treatments.....it has been one more journey. Today was also Rick's birthday.......he got to spend it at the clinic with me, six hours.....not much celebrating at the Watson house tonight. We are both exhausted. This morning was busy in the infusion room, things slowed down about noon.....I met a new chair buddy.....she's young and scared.....but there is strength in her eyes. She kept asking the question that probably most ask when they sit in those green chairs......."why me?" There is no way I can answer that question.......it is one of those that for some there is no answer, for others, like me.......I finally came to the conclusion....."why not me". We talked for a long time......some want to talk, others don't......at least not at first.....but sooner or later, it truly helps to talk to someone else who sits in the green chairs. We might not share the same disease, but we share the bond of those drips and those chairs. Half way across the country, another friend was getting his drip today. He called this morning to wish Rick a Happy Birthday. We wished each other luck with the meds . It's interesting how your support group develops, I have friends who text me on drip days, encouraging me to stay strong, to know that I am loved, and to rest. They will never know how much their words mean to me.......there are days in that green chair when I feel like Alice, and I have fallen down the rabbit hole......never to know normal again. I have been down today, I felt so bad that Rick spent his day at the clinic with me......but he knows, if the roles were reversed, I would do the same for him. The nurses as always were so kind and caring, making sure all was right in my green universe. I watch them, amazed at their skills, their compassion and their energy. In another life, I hope I come back as one of them.....they do such important work. I still can't believe today starts my third year in those green chairs.......it has been an eternity, it has been five minutes.......it definitely has changed my life. There is the most beautiful, almost full moon in the sky tonight. I left work this evening at the most magical time of the day.......not day, not night....the sky was almost indigo and there hovering above me was that great big silvery orb. We had done moon salutations in class today, to greet the full moon this week......and I think the universe gave me a thumbs up, because as I walked to my car, in a crystal clear sky was that exquisite moon greeting me. The road was almost empty as I drove home, but the moon seemed to follow me ......like a good friend, concerned about my well being. I have said this so many times, but during the week of the full moon I feel so close to my friends scattered around the world.......because I know the very same moon filling my night sky with such glory is doing the same for them. It's that connection of being bathed in moonlight, of having the night sky reaffirm all that is beautiful and good. Where ever you are tonight, as you read this blog, know that the moonlight that shines through your window also shines through mine......and we are not so far apart. Anxiety.......that is what we covered in today's yoga classes. Yoga helps with anxiety, we began with the breath.....if you feel anxious it may be hard to take a deep breath......you focus on the exhalation and not the inhalation. Breathing through the nose is calming, it slows the heart rate and slow exhalations calm the stress centers in the brain. I placed folded blankets across the abdomen, eye pillows on the eyes, and we began once again to control and focus on the breath. When class was over, each person commented on how much calmer they felt, how relaxed. Yoga's gentle moves, breath work and meditation as well the awareness it brings to the body and it's functions truly helps those prone to anxiety and panic issues. Both classes this afternoon were pleasantly surprised by the calmness they all felt when class ended. This week is treatment week, so this weekend as usual before treatment, I hit the wall. ( two years or more) IVIG treatment I would like to hear from you. I am starting my third year and would like to talk with others who are going through long term treatment. You can contact me by commenting on this blog or by private message on FB. Knowing someone else I think, would help me through the rough spots. Blessings for the new week, we are facing a beautiful full moon this week.......I hope its beauty shines down on you and fills your heart with joy. Blessings to all the "weird people", long may we shine our light in the darkness, long may we teach and may we always be weird. gentle rain on the tin roof tonight......Calliou the wacky collie prefers to sleep outside under the porch when it rains, we probably won't see him til morning. I did not get a good night's sleep last night......one of those nights, when you go to bed knowing you have to get up earlier than your normal rise and shine time........and I must have woke up at least a dozen times in a panic that I had over slept. What makes you do that? I hear the bed calling my name as I type.......no need to rise early tomorrow, just get up when I smell the coffee. I love those kind of mornings. Wishing you a good night and very sweet dreams. I use to think that anger over the injustices of the world would solve the problem......I thought if we all got angry enough we could change anything. But the past few years I have released the anger.....I knew that anger for any reason was bad for me, physically and emotionally.....I read, and I studied.....the more I learned, I realized to change anything it takes love. Mother Teresa understood the power of our thoughts, actions and words.....she knew if we focused our energy on war.....that is what we get......when we focus on peace, we get peace. All through the centuries, wise men have taught......we get what we think about. It is a very difficult thing, to bless someone who seems undeserving of blessing, but I think we have to reach that place.....it is hard to love the unloveable....to be kind to those who are unkind.....but if we treat those who mistreat the way they treat others......we become just like them. This life, this path is such an experience.......it is easy to get caught up in something....to use up your life energy with anger......and it all be in vain. We can change things, but it has to be done with love, not anger, not hate......it has to be done with love. Grief and loss, it can be the darkest hole you ever find yourself in, with seemingly no way out. Honestly, I don't think grief ever ends......I think it becomes a part of your life......sometimes it eases up and fades.....but it can hit you like a tidal wave when you least expect it. I think our society has led us to believe that there is a mourning period and then it goes away......Ha! Loss is profound, loving someone with all your heart doesn't stop when they die.......life eventually reshapes the hurt and the pain.....but I don't believe it ever goes away. It has been 23 years ago this month since my father died, and there are times when that wound opens and the hurt is just as bad now as it was then......the good news those times are not daily anymore. My mom and my oldest brother died a couple of months apart......I have very few memories of my life for about three years after their deaths......I think I went through the motions of living, but it took some time to live again. I have friends and family members who have buried their children........their grief goes on, just as their lives go on.......in some ways, I think they become the walking wounded forever.......they don't have scars, but big holes in their hearts that never heal. I have good friends who are dealing with grief and loss tonight.......their wounds are fresh, that time when even good memories can cause pain.....their lives on emotional roller coasters, one minute they feel everything, the next nothing. I have students at the addiction center who tried to numb the pain of grief and loss with drugs and/or alcohol.....sadly, they learned, nothing eases the pain but time itself.......it doesn't disappear, but you do get respites from it. What I have learned about grief and loss.......it is part of life, we can't stop it.....and we all make it through one way or another.....and sometimes we don't. are energizing for growth come spring....and though it might not seem possible now, spring will come again. I also think of those humans who are in the "winter" of their lives, they may have lost their physical beauty to some, but their "roots", their stories are full of life and vigor. Their "roots", their memories are there for the sharing if we take the time to listen and learn from them. of gorgeous flowers that spring and a bountiful harvest of fruits and vegetables. this spring might just be one your most beautiful ones ever.....mother nature is resting and storing up energy, there is a riot taking place for our benefit. The gift that winter brings......the return of spring. Bitter cold, flu.......it has been quite a January for Alabama so far.....six degrees tonight, only eighteen for a high today......stay warm, I know the cold is raging in a large part of the US, once again stay warm. Classes were small today, I cancelled the community class tonight.....no one wants to get out in the cold. Today five small young deer were in our back yard, I worry about the animals tonight. I hope if you have pets, you have brought them in, or they have a warm dry place to sleep. Old habits die hard, when I was a teenager and started to drive, in the winter months my dad always insisted that I have gloves, hat, scarf, and coat in the car with me......I still keep an extra jacket and usually a blanket or two in the back seat......just in case. I now lecture Samantha and Jordan on the importance of those same things. And while we are discussing preparedness.....it is still not too late to get a flu shot.....and wash your hands, wash your hands, wash your hands. The flu can be deadly, see a doctor if you think you are coming down with it. Ok, lecture is over, I am off the soapbox......stay warm and cozy and well. in all our glory. Ready to take the stage at Berkeley Bob's last night. I am also the MC for the group when we perform, here I am sitting on the edge of the stage waiting to announce our first performer. What a night, so much fun, so much good music. 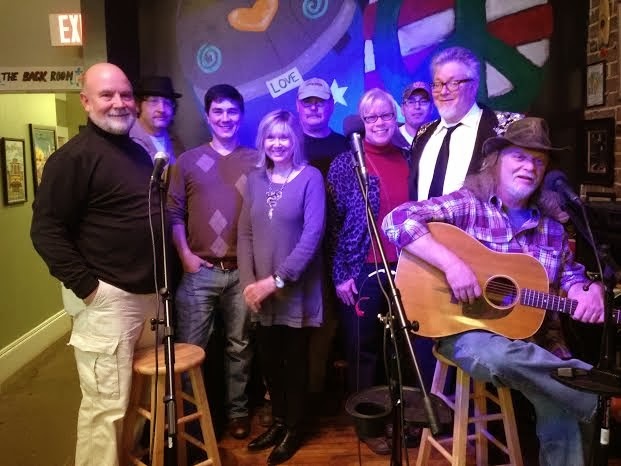 A short post tonight, it is late, and I am very tired.......our group played it's CD release concert tonight.....and it was great. All night people kept making comments about how much they were enjoying the show......and it was a really good show. 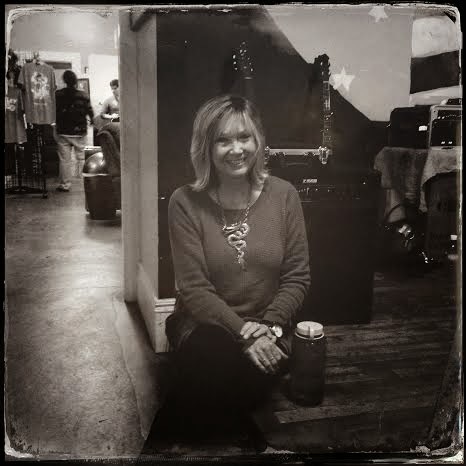 I am a lucky woman.....to play and sing, to teach.....to hang out with creative, fun people. And I do hear my cozy warm bed calling my name. We promised ourselves we would spend more time with friends......we are keeping that promise. Last weekend was spent with friends, tonight dinner with friends, and tomorrow night.....playing music with friends. Our friends have been there with us, through loss and grief, and joy and good times. 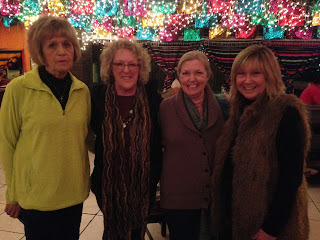 Everyday when I say my gratitude prayer, it includes being grateful for my friends. They really are the spice of life. Meditation classes today.......I love to see faces change, and that change is dramatic when someone experiences meditation for the first time and nails it. Meditation like yoga, is a practice, but achieving what I call the sweet spot can happen on the first attempt......and when it does, it is heaven. Some of the students are always apprehensive when I announce that we are going to meditate.......for some it is the thought of stillness.....for others, the fear that their thoughts will bombard them.....and today, there were those who were not really sure that they wanted to stay when I announced we were going to meditate. . But, both classes enjoyed the meditation process, for those who feared the worst, they were surprised at how painless it was, and for those who were eager to try, they were not disappointed. I always tell them my personal theory of why I believe that they are in a rehab facility.......they don't know how to relax.....they think they do, with alcohol and/or drugs.....and when true relaxation takes place it is a small miracle in their lives. The fear of looking inward leaves, the fear of stillness leaves and they begin to experience peace. (you can set a timer) and see how it helps your day......not that it will change the bad stuff, but it will change how you react to the bad stuff. This is a brand new year, instead of beating yourself up because you haven't lost weight or gone to the gym.......be kind to yourself, sit in stillness and breathe......one good habit will break the chain, and other good habits will follow......start with kindness to yourself......meditation is the first step.